CHILE’S BACHELET HOT AND COLD IN SWITZERLAND. President Well Received By U.N. Human Rights Commission, But Criticized By Protestors. (June 5, 2007) President Michelle Bachelet returned to Chile Tuesday after concluding a week long European tour Monday in Geneva, Switzerland, with a poignant speech at the United Nations Human Rights Commission. At the event organized in her honor, Bachelet spoke of her experience as a torture victim when held with her mother as a political prisoner in the Villa Grimaldi prison. Many prisoners takenVilla Grimaldi were never again seen alive; it was one of the most feared prison centers during the dictatorship of Gen. Augusto Pinochet. In her speech, Bachelet said she was proud and full of joy when she inaugurated an expansion of the Villa Grimalda Peace Park during her first year as Chile’s president. The President also confirmed that a United Nations Latin American Organization would be set up in Santiago to deal with human rights issues. The event honoring Bachlet was an important part of Chile’s campaign to be named a member of the United Nations Human Rights Commission. At the International Labor Organization, ILO, earlier Monday morning, Bachelet said her administration is committed to creating more employment and to improving the nation’s social protection networks. “This will be the crowning achievement of my government, it will be the way that we will distinguish ourselves in history books that will say how my government, following the steps taken by my democratic predecessors, was able to leap forward in terms of social rights, and build a foundation for further social protection,” said Bachelet. The ILO event occurred without a hitch. Organizers were concerned Bachelet would face protests over her government’s patchy record towards the nation’s indigenous populations. Earlier, Bachelet faced tough crowds outside her hotel in Geneva when 400 Chileans living in Switzerland gathered to hear her speak. Twelve Chileans, calling for “freedom for Mapuche political prisoners,” presented Bachelet with a petition signed by Patricio Ortiz Montenegro, a Mapuche activist given political asylum in Switzerland in 1996. The Mapuches, Chile’s largest indigenous group, are locked in a struggle with the government and forestry companies over property ownership and autonomy issues in southern Chile. Activists sometimes resort to land occupation, vandalism and arson to press their cause. 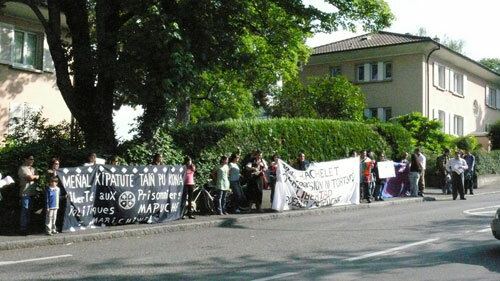 Gloria Kilbert, the director of an association of Chileans living in Switzerland, criticized Bachelet for the continued mistreatment of Mapuches, and also for the government’s use of “excessive force” when dealing with protests. On May 3 police shot 26-year-old Rodrigo Cisternas, a subcontracted forestry worker, three times after taking part in a labor strike. According to official accounts, Cisternas was shot after he attacked police vehicles with a tractor he was driving. Police were attempting to disband the road-block set up by the protestors that backed traffic up for over four kilometers. Scores of other workers were injured (ST, May 7). Bachelet said she would take into account all the petitions and protests she received. El Mercurio reported that Bachelet - visibly tired and her voice hoarse from a cold – completely blanked out when naming her government’s achievements in foreign relations. After a moment’s rest, she then continued to speak about the general success of administration in health, education, and poverty issues. Bachelet ended her talk to the group of Chileans with several jokes and was then profusely applauded. In related news, Sen. Pablo Longueira, a member of the Independent Democratic Union Party (UDI), accused Bachelet of shirking pressing national responsibilities by using the tour as a means of escaping Chile’s gas crisis and Transantiago fiasco. According to Longueira, “the presidents elected by the Concertación coalition are obsessed” with taking the trips around the world.